A comprehensive Deadpool reading order, from A to Dead. Enjoy! Deadpool’s actually one of the few Marvel characters you can truly read all the way through without dedicating years of your life. Since his origins are in the 90’s, there’s only (only) about 20 years of continuity to sift through. Granted, if you read all of these Deadpool issues in a short period of time you’ll lose your home, job, family, and mind, but still, a comprehensive reading order back to the start! The Best Deadpool Comics To Start With! While many of you may want to read every Deadpool comic in chronological order (see below! ), if you’re new to Deadpool, here are the top 10 starting places for reading the Merc with the Mouth. I also cannot recommend highly enough Deadpool the Video Game . It’s an absolute blast, and actually serves as a perfect visual introduction to the character. Deadpool the video game actually helped me enjoy the comics more, and has set enormous expectations for what the character can do on screen. If you’re only interested in the modern Marvel Universe (around the start of 2000), you can skip on down to Deadpool Classic, Vol 9, with the start of Deadpool and Agent X. Note that the (newer) “Beginnings” omnibus will collect a bunch of the early Deadpool appearances, overlapping with the likes of Deadpool Classic, Vol. 1, Deadpool Classic Companion, and Deadpool and the Secret Defenders below. Dave’s Note: A lot of readers have asked about the newer volumes of Deadpool Classic, such as Vol. 11 to Vol. 13. These collected editions are all included in various collections below, and are better fits later in the reading order. Don’t worry, you won’t miss any Deadpool if you keep on going from here! II) Cable & Deadpool Reunite! You’ll also notice House of M & Civil War Deadpool tie-ins around this time! While you’ll note that the first Deadpool by Daniel Way collection does include Way’s first Deadpool story in Wolverine Origins, it’s worth mentioning separately for the Marvel Unlimited crowd. Kicks off hard with Secret Invasion and Dark Reign tie-ins. Absolutely fantastic, all-time great read that includes Deadpool as part of Rick Remender’s Uncanny X-Force. This is very possibly my favorite incarnation of Deadpool ever (Cable & Deadpool are in contention). Highly recommended additional read outside the core Deadpool book. A Fear Itself tie-in, three issue miniseries. Daniel Way gets in some more time writing Deadpool as part of the new Thunderbolts. For more on how the Thunderbolts fit in, I recommend checking out the Marvel NOW! reading order. While yes, this is a Secret Wars tie-in, in classic Deadpool fashion, it’s tied in to the wrong Secret Wars (the 1985 original instead of the 2015 newcomer). Published a couple years after Secret Wars, but the follow-up to Deadpool’s Secret Secret Wars. Following Secret Wars, Deadpool really hit the big time, with the release of his real-world Ryan Reynolds movie taking theaters by storm, and with the relaunch of his new series. 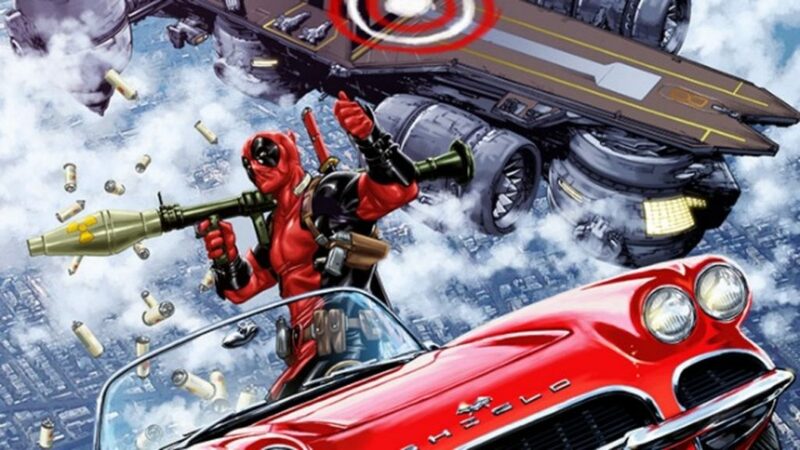 Plus… Deadpool became an Avenger! No, for real, Deadpool joined an Avengers team. Collects the first six issues of Gerry Duggan writing Uncanny Avengers. One of my favorite comics of 2016, from Deadpool OG Joe Kelly! Includes Uncanny Avengers tie-ins to Avengers Standoff. Quite possibly the least tied-in of any Civil War II tie-ins. Takes you through Deadpool #14 to #19. Takes you through Deadpool (2015-) #25. An Inhumans vs. X-Men tie-in. Collects Deadpool & The Mercs for Money #6 to #8, plus Annual #1. 4 issue miniseries with Deadpool investigating the potential assassination of all Marvel’s funniest characters. 5 issue miniseries. For shame, Marvel, for shame. Loving the new updates, thankyou. Where does the rest of the Uncanny Avengers fit into “All-New All-Different Deadpool”. Gets to Vol. 3 then no more mention of it. Hey there, thanks for the extensive list. I had one question if I bought the Deadpool Beginnings Omnibus do I skip some of the collections or are they seperate? Thanks. If you REALLY enjoy the character of Deadool than you should NEVER read the Daniel Way run..and avoid everything from that era where he has more than one voice in his head. Hot garbage! is it “X-Factor #1 to #24 —” or “X-Force”? I think there may be a typo. Correct, that should be X-Force. Updated! Could you please update this list (with the actual run, and the new mini/limited/oneshots) ? Have a nice day! Are all possible issues truly gathered in this list? Has anyone located any issues that are excluded from the current list? I just read all of the Daniel Way run to get ready for the movie. I really enjoyed it and I haven’t read hardly any of the modern stuff. I saw some of the reviews saying that the last 1/4 of the run wasn’t very good but i disagree. If you’re reading it faster than one issue a month, the slow parts don’t seem slow at all. Hey Dave thanks for the list. Have worked through the classics on your list (just finished Vol 10) and about to get into Deadpool&Cable. Just a little confused with the new classics coming out (currently all the way to Vol 16). Would marvel not of put these new Volumes together in the best reading order compared to your different one above? e.g. Deadpool Vol 11 collects Deadpool: Merc with a mouth 1-13 and obviously follows Classic Vol 10. On your list you recommend reading Deadpool&Cable, Daniel Ways Vol 1 and Suicide Kings before Merc with a mouth. Are you saying that in this instance the storyline/order doesn’t matter? Thanks mate, list is serving me well so far! I think Classic Vol. 11 is actually a better read closer to when it was published (late 2000’s). Marvel really jumps ahead with those collections (about 6 years), and while they’re contained enough that you’ll be fine just going in order, there are some big picture Marvel U tie-ins that don’t really make sense until later. isn’t it supposed to go issue #17 then Deadpool & Death Annual right? or does it just go straight like it reads from 17 to spiderman to 18-25 and then read Deadpool & Death Annual? I would really love and appriecate some help, my sister is a huge deadpool, marvel anything geeky fan! She just digs it! I would love to win utter sister points and buy her a deadpool first edition for Xmas. Problem is I have know idea where to start! Any recomendations? Thanks again! If your sister has been into comics for a while (like dating back to the 90’s), then I’d go with classic Deadpool. Otherwise, the Marvel NOW Deadpool from 2012 is a good starting place for many. When is deadpools dark era? like when we was kind of depressed and struggles to do good and is basically a villain? Do you know where Deadpool/ widdle deadpool is sittuated? my guess is in Deadpool classics, Vol.5… not sure though and kindda stuck. I’m starting the whole thing now 🙂 let you know when i’m done! good work !! This is actually pretty much from origin to present day. Deadpool doesn’t start until (relatively) recent, so there are fewer holes. Enjoy the comics! Just started reading comics thanks to a new tablet and was completely overwhelmed by series continuity. Thanks for clarifying with your research and guide, I had no idea what I was stepping into. Dave, I was going through and ordering the Classic volumes 1-10, but noticed there are more Classic volumes past volume 10.. there is a Volume 11… DO I get this? or continue with your list? I think the Classic Volumes go all the way to 15? Quick question for the below I am going to mention (can they be read as stand-alones whenever or is there a spot you recommend)? Deadpool Pulp, Return of the Living Deadpool (and by extension, Night of the Living Deadpool), What If? Venom, are all non-canon stories. They can be read just about whenever. Secret Secret Wars is a 2015 Secret Wars tie-in, but it’s set in the original secret wars. I say it’s 2015 Secret Wars because it has that logo on the cover, and it also changes some of the stuff with the original SW, so I guess it’s your own choice if you want to put it at the end, or at the beginning. Deadpool vs Thanos is presumably after Secret Wars based off the publication date, but to know for sure, we’d have to wait till SW is over. Encyclopedia Deadpoolica, Deadpool Corps: Rank & Foul & Baby’s First Deadpool Book aren’t really stories, they’re just information, so they don’t really need to be read. LDP One-Shot I’ve got after Deadpool Family which I put after Deadpool corps, but I’ve heard it goes before the corps issues. Not too sure about my placing. X-Men Origins: Deadpool would be placed more or less at the start if you consider it canon. As for “The Decoy” I have it just before Daniel Way’s run begins. What about DP/Cable #26 and DP #900 and DP #1000? So yeah, like I said, I haven’t had a proper chance to go through and make sure everything’s 100% in the right spot, so just use this bit as a general guide until you find something better. Thanks for the feedback! Updated. Do you have a more concise guide for deadpool. Like just the essentials or best of? Bless you for this and all that you have done. 1) Wolverine Origins – you suggest above that ‘Daniel Way, Complete vol. 1’ includes this – do you know if these are the full issues or ‘extracts from’? Is it worth reading the entire series of Origins for the full story or is the Deadpool section relatively well self contained? 2) Thunderbolts (volume 2) series is not included above – where should this fit? 3) Other missing limited series – Pulp, 5 Ronin, Fear Itself, Return of the Living Deadpool, Secret Secret Wars, Venom – What If? Again, stand alone or appropriate elsewhere? 4) There are some new entries in the Classics collections – being 11-13. 11 appears to collect the Merc With a Mouth series, 12 all of the Deadpool Corp stuff (including Rank & Foul?) and information on 13 seems sketchy at present but I believe will cover off all of the Team Up series. There also appears to be a Classic Companion looming including a few random issues from long ago. Any solid confirmation of details of these collections would be great! I think that’s about it! Thanks in advance for any suggestions. Don’t suppose you’d be willing to do another version of this that goes by individual issues instead of TPB’s, could you? If you would, that would be highly appreciated. I do mention all the issues you’ll need in order… not totally sure what you mean? What I mean is that he makes guest appearances in tonnes of other comics, as well as the fact that there are flashback issues that take place before the spot where they’re listed, as well as stories that weren’t mentioned at all like Return of the Living Deadpool, Deadpool vs X-Force, The old 90’s X-Force comic, etc. If you want a complete list of a characters appearances, then I suggest visiting Comic Book DB and searching for the character there. Dave was providing a reading order for comic book runs featuring the character, and did an excellent job providing that, in my opinion. To end, I have a question: How Deadpool should be read alongside your marvel guides(i’m talking about the general guides)? I wanna be prepared when I reach to the 2000’s Deadpool, and I’m seeing it intersects a lot eith the series in the part 1 of your guide. PS. : Sorry for my English, I know I speak it like a caveman. Most of section 1 of the guide can be read before part one of my guide. Once you hit Agent X you’ll have entered part 1 of the guide. I try to call out in the next sections which events overlap with the Deadpool reading. For example, during Cable & Deadpool, you’ll hit House of of M tie-ins, and then later Civil War tie-ins. Once you see the House of M banner on a Cable & Deadpool issue, you know to jump to the House of M reading order. Same goes for Daniel Way’s run on Deadpool with begins with Secret Invasion and Dark Reign. Hope that helps and enjoy the comics!